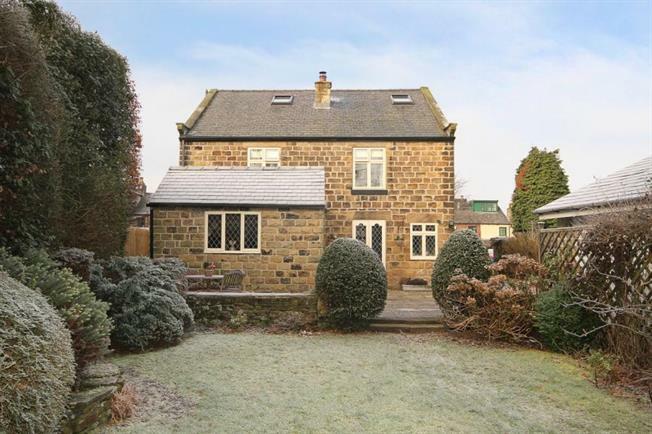 4 Bedroom Detached House For Sale in Dronfield for Guide Price £450,000. Blundells are delighted to offer for sale this immaculately presented four bedroom detached family home with private rear garden and detached double garage. The property is situated in the popular residential area of Coal Aston and an internal inspection is highly recommended to fully appreciate the property on offer. The property is made up of a charming open plan dining kitchen, fitted with range of matching wall and base units with worktops over and tiled splash backs. The kitchen also has integrated electric oven, microwave and a six ring gas hob. A number of windows are located around the room and give it light airy feel and is afforded plenty of natural light. A generous lounge is tastefully decorated and has hardwood floors, exposed beam work and a stone fire surround and hearth house a real flame log burner. The lounge leads in to another spacious room which is currently used as an office but could also be used as another sitting room, snug or dining room and sees a continuation of the exposed beam work and hardwood flooring. A cloakroom completes the downstairs accommodation. To the first floor you will find a spacious master bedroom suite with an en-suite shower room comprising of a walk in shower, toilet and wash hand basin. Two further double bedrooms are also found on this level and family bathroom with three piece white suite made up of Jacuzzi bath, wash hand basin and toilet. The attic houses a fantastic fourth bedroom which is ideal space to be used as a guest suite or is ideal for teenagers. There is also a en-suite shower room with toilet, wash had basin and a fantastic walk in shower. To the rear you find a lovely garden which is mainly lawned with well stocked boarders and a number of trees give a sense of privacy. There is also a detached double garage which is supplied with power and lighting. Coal Aston is ideally located between Sheffield and Chesterfield and offers great commuter links the area is also well connected with public transport with a number of bus services and a train station close by in neighbouring Dronfield. There are also a number of local amenities such as Schools, Doctors, local shops, supermarkets, a number of pubs and restaurants.